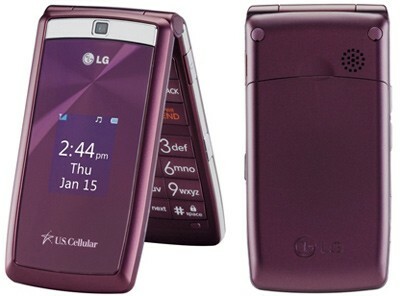 LG’s is now offering the Wine that showcases a glossy clamshell phone with a small 1.3” external display. The Wine does not have EV-DO support, but it is does have a GPS, a 2.2” QVGA internal display and a 1.3-megapixel camera. This phone has only four shortcut keys, a large numeric keypad and features a high fidelity speakerphone. You can get the LG Wine in either Red or Silver for $30 after a contract and mail-in rebate. in case you want to get it without a contract, we offer this stylish phone unlocked. Well I just got this Phone from US Cellular the other day. It is a nice phone for looks, and the menues are nice, and easy after you play with it a bit. Sound is ok, and very loud if your hard of hearing. First is... If you use the speaker phone the person your talking to will hear an echo. Second is.... I loose signal a lot. I am lucky to get 1 bar here. I had no problems with my AT&T Nokia phone in this area. Most times full signal bars. It looks like I will be bringing this phone in for a exchange tomorrow. Ok brought phone back, and they changed some settings. Phone still has the echo problem, and always will I guess. Not a problem for me.